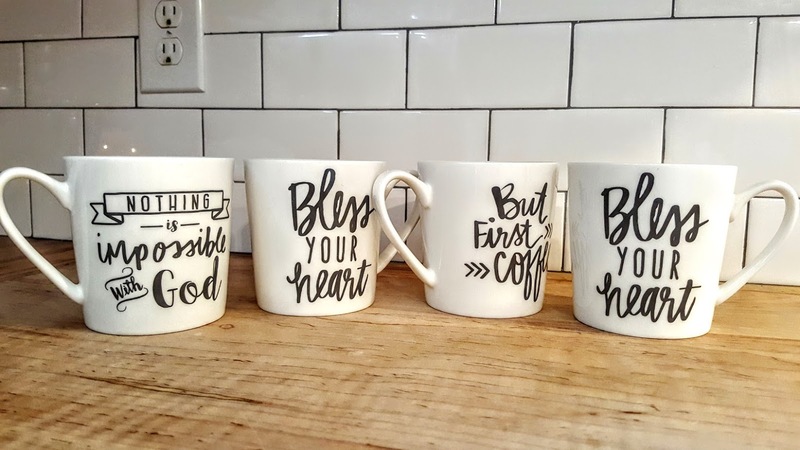 Who doesn't like a good coffee cup?!! 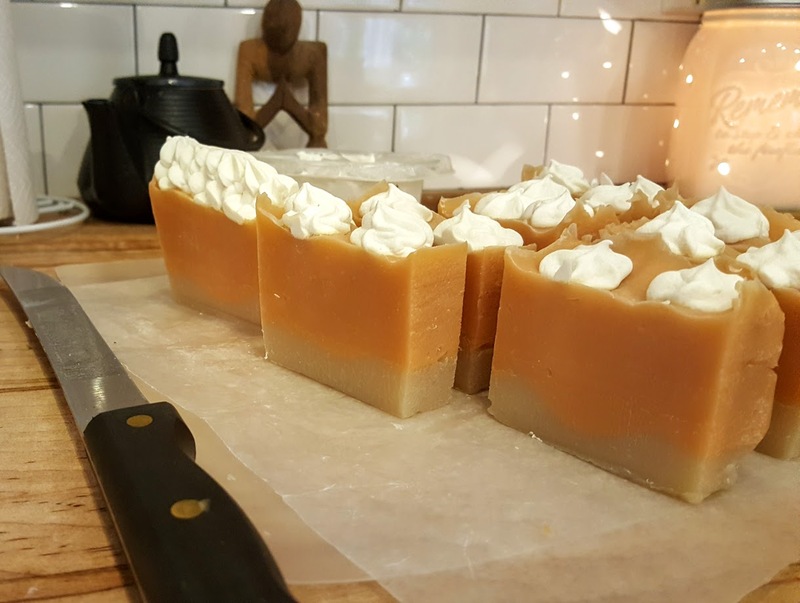 or pumpkin pie soap? I LOVE LOVE a new cute coffee cup! These are some that we have included in our gift baskets that you can do for Christmas. The ones you have seen on the hooks in my kitchen that say Bless Your Heart, or other cute sayings are displayed here! This is basket that I just completed for a friend for someone for there Birthday. The one below is 40. It includes the soap dish and coffee cup. 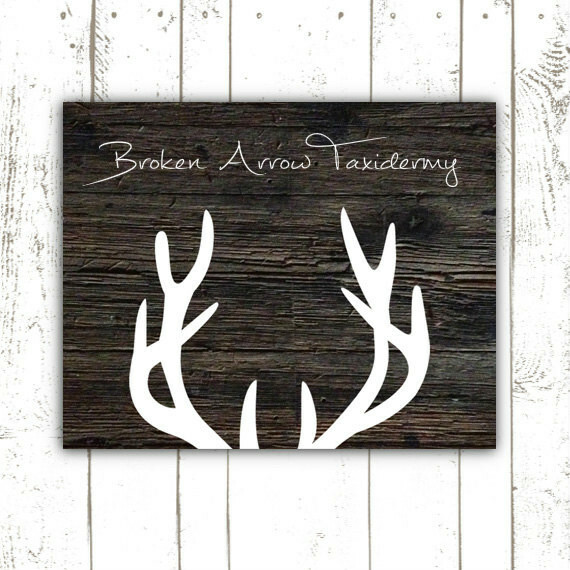 Get yours ordered to be here in time for the holidays! 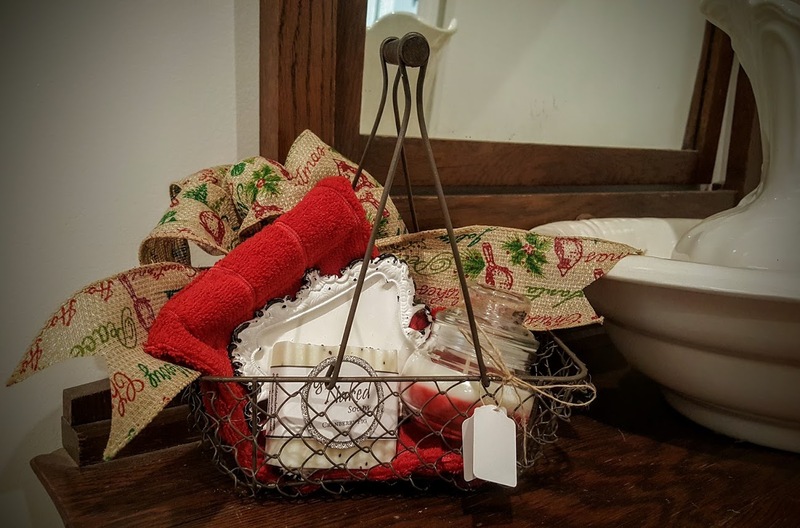 This holiday Christmas basket would be excellent for teachers for school, use the soap dish its 18, but if you would rather use the coffee cup it would be 20. Would be glad to customize it the way you would like. You could even do a small one with a towel, soap and candle for 15! 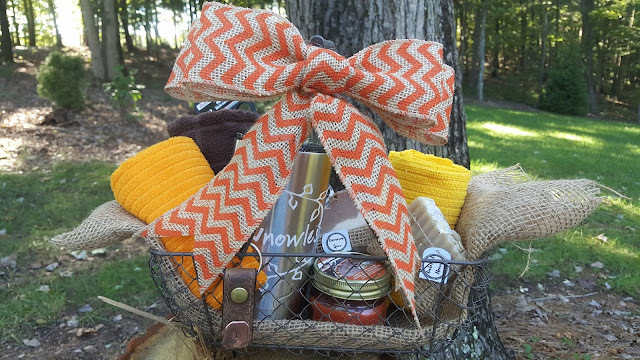 This is one of our newest scents Pumpkin Pie! There are so many things that are thrown at us for the holidays. Gifts, gatherings, and special events. I always am one of those people who look and look for that one unique thing. I want something special for people that says, "Hey, I really thought about you and something you may like!" Don't get me wrong I still do gift cards and gift certificates sometimes, but its nothing like having a gift that really looks cute, or is something that's different. So what I'm working on now are the gift baskets that we displayed back for the fall, but incorporating Christmas stuff. 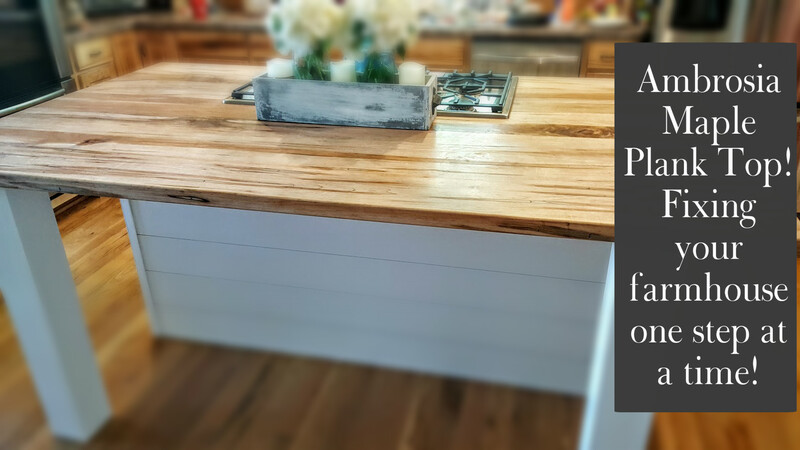 We have different ways or things that you can put in them to allow them to fall in different price ranges. The one I'm displaying today is 18$. It contains a microfiber hand towel, wire basket, candle, soap dish and a bar of my Cranberry Fig Soap. (you can chose from any scent) We already have a ton of these on order for people because they wanted them for teacher gifts. You could do one smaller say 15 (towel, soap and candle). Which, I would love to get considering I do homeschool my kiddos. So if you need one, send me a email! 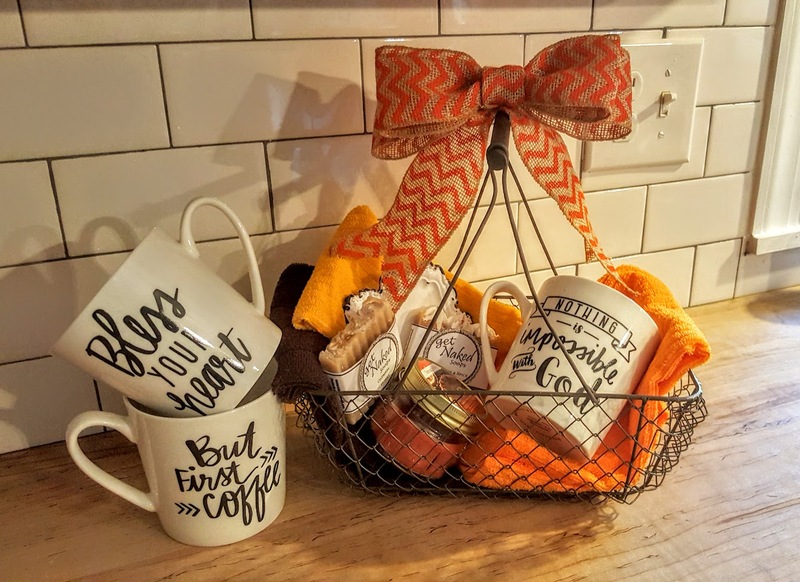 We also do a range of dollar baskets, so you basically could customize a order with what all you would like in your basket. Hope you like them! "Get Naked Soaps & Signs"
The Sign that birthed the name! I had been looking on Pinterest for a idea for a sign for my bathroom. I had seen a couple here and there that I liked. Ones that said different things. I ran across a pallet one that said "get naked." So I then go to take a shower and start laughing. I thought, "Really, its kinda a cute idea cause dang, that is what you do in the bathroom!" So from there ideas started to bloom. I have been making homemade soap all year. I started back in the fall of last year making the bracelets and key chains, then moved onto soap. 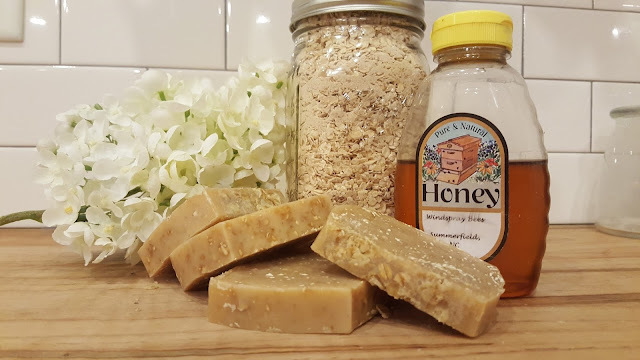 I have always wanted to learn how to make homemade soap. 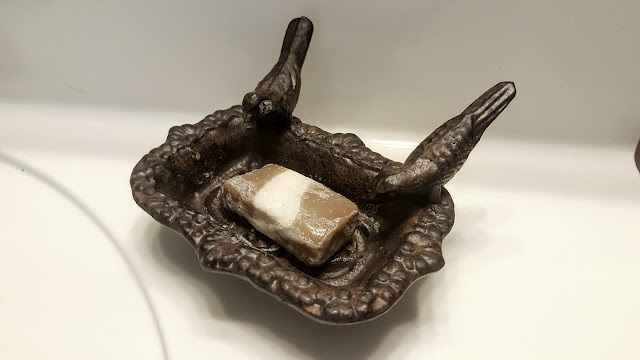 Back when I was a kid and my mom worked at a dentist office she would bring home some of the best homemade soap and I would love love to have it in my shower. So after trying different ways and recipes I found one that consisted of the oils I really love to use on my face as moisturizers, Olive Oil and Cocount Oil!!! These are so so good for your skin. So after working, trial and error I have finally come up with a line that I like. My family really seems to like it so I decided to put it in a store in Eden. 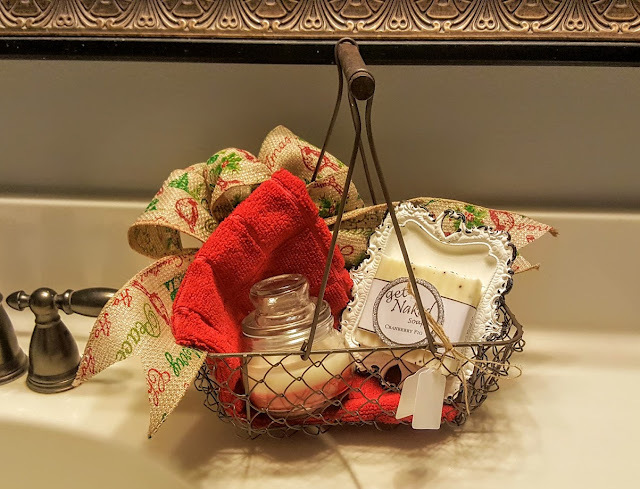 Its on my Distressed Blessings facebook page, because I also like to make gift baskets, but I wanted the soap to have a name and I hadn't come up with anything. One day I walk into my bathroom and the sign I made is hanging on the wall and BAM! I was like duh!!! That's it! The kids was like ooh gross MAMA! Their Daddy's says, "Hey, can you wash with your clothes on?" We all start laughing and that's it! We decided it sounded like a good name. 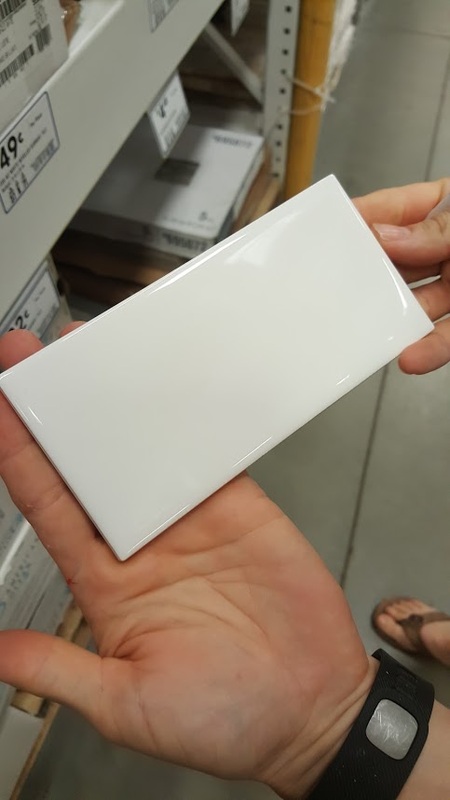 For the sign, I took the thinnest piece of plywood you can purchase, painted it with 99 cent cheap white paint from Lowes. I used my Cricut to print out the black vinyl letters. 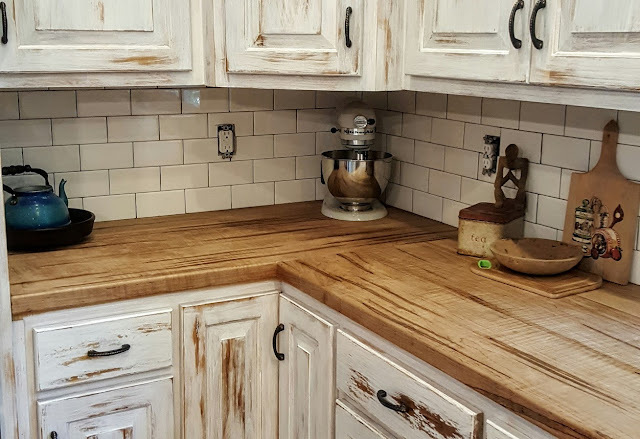 I used tobacco sticks from my daddy's farm, measured and nailed them with a nail gun to the plywood and Voila! Who knew that so many ideas could come from just one sign.! 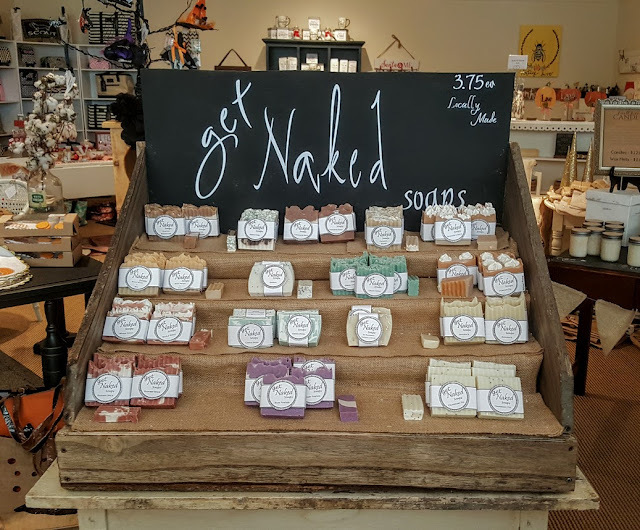 This is our display at Gabrielle and Riley a store you can find and purchase our soaps. The soaps are 3.75 a bar. We also have a couple of Christmas Scents that will be ready really soon. We look forward to starting this business and hoping that people will share our love for homemade soap. We are making small gift baskets that you can order for the holidays. Those pictures will be posted in the next few days! Thanks for looking! 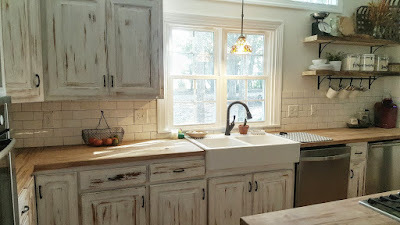 I've been talking a lot about my kitchen lately. 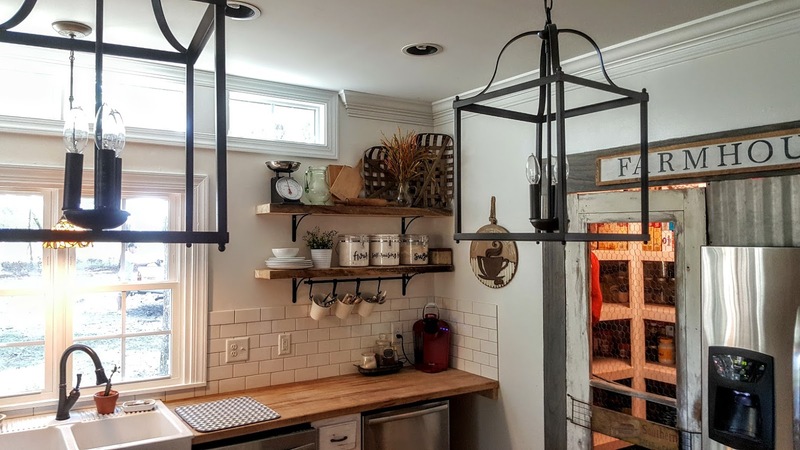 So what woman doesn't like little new things for her kitchen? 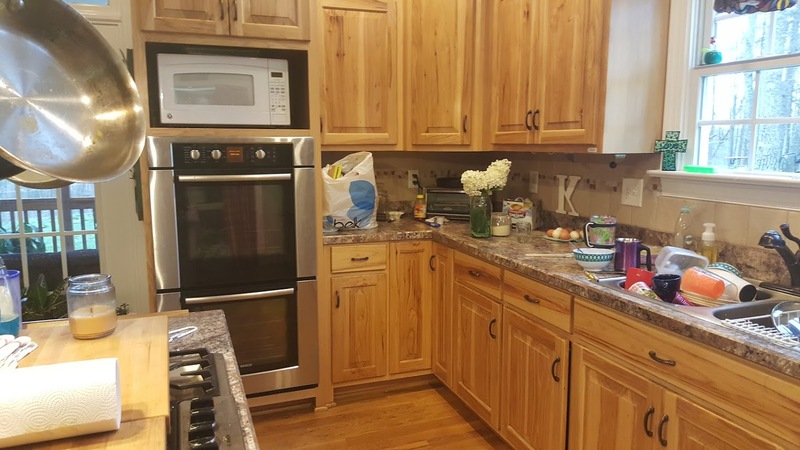 Even if you don't like to cook, you may like new hand towels, new coffee cup, new hand soap?? I know I get giddy about a new cup or candle! Especially if its a new season. So for right now to help introduce my new Soaps (Get Naked Soaps) I'm working on making some gift baskets. These I have started as a welcome home package that agents could get for a new homeowner or any type of gift. 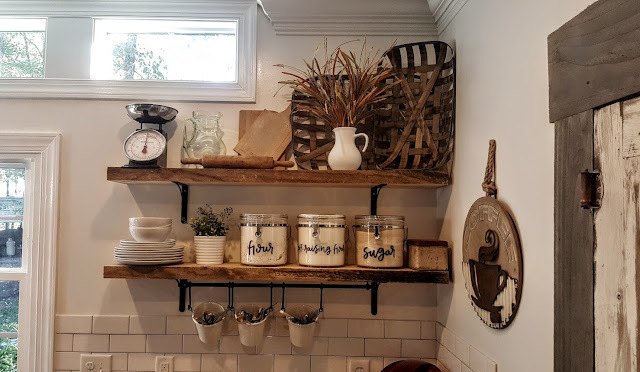 These little baskets are full of goodies and you see them posted through out my kitchen as farmhouse decor. If you are interested in getting a basket made please send me a email. You can also do a smaller basket with items requested to make the basket. So this is what I ended up with after I moved it and put the molding back up. 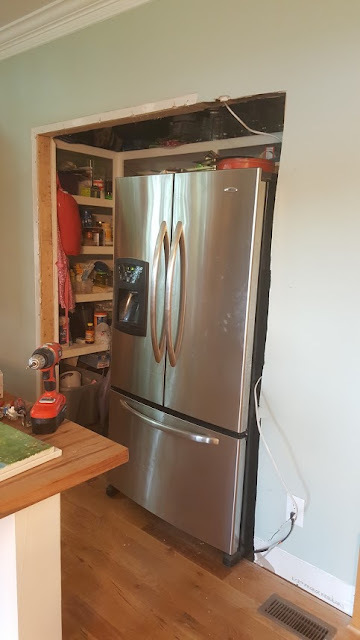 No more doors smacking the wall! Score! 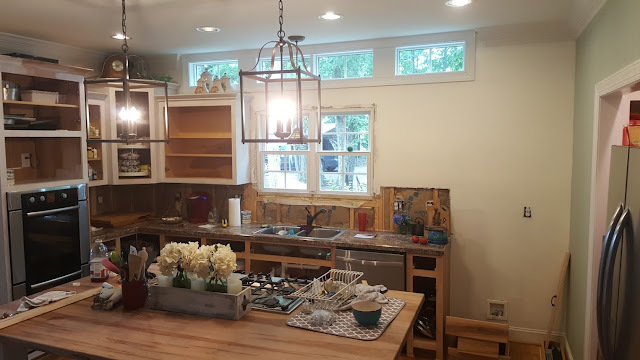 Ok, so now that I had all that arranged, the mess I ran into is because I had this big plan to hang one of those awesome barn doors(that we make ourselves) that slide back and forth. Well, since I was gonna have wood counter tops all the way to the wall to make more counter top space, I couldn't go with the barn door because there would be nowhere to slide it to open. Ughhhh!! So now back to the drawing board! 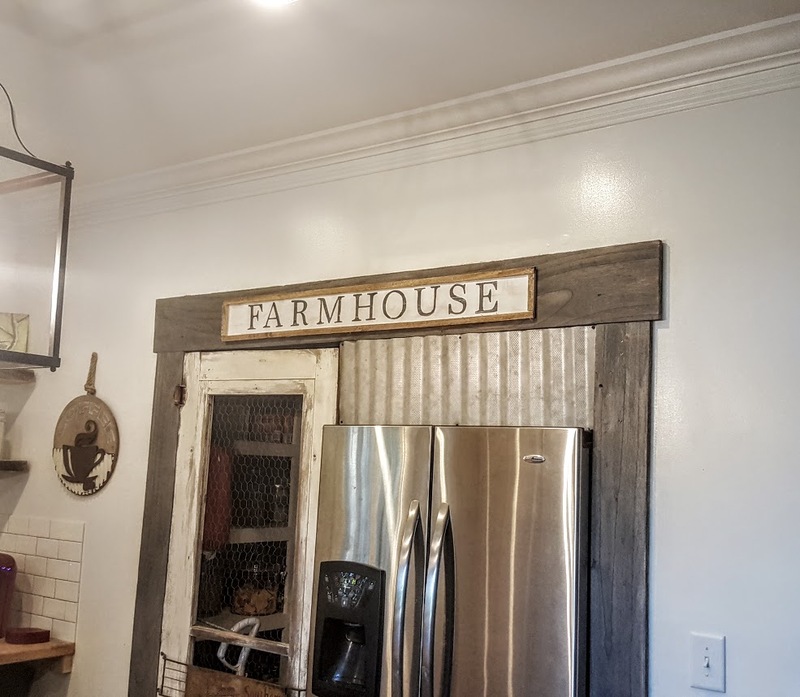 I looked and laid there at night trying to figure out what to do, when I decided, well if I can't do a barn door, I may just make the whole opening look like you are entering a barn. Especially the ones on my papa and dads farm that we had when I was growing up. 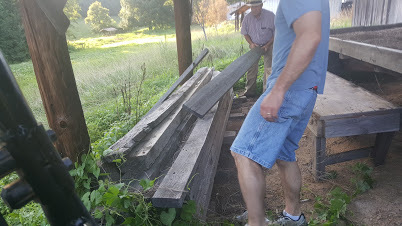 They would use these old barns to cure tobacco and they had these old wood log openings. So I was gonna try to duplicate that the best I could. So I started with attaching wood planks that my dad had from off a farm he worked on and a old screen door from a farmhouse. I removed the old screen and put chicken wire in its place. 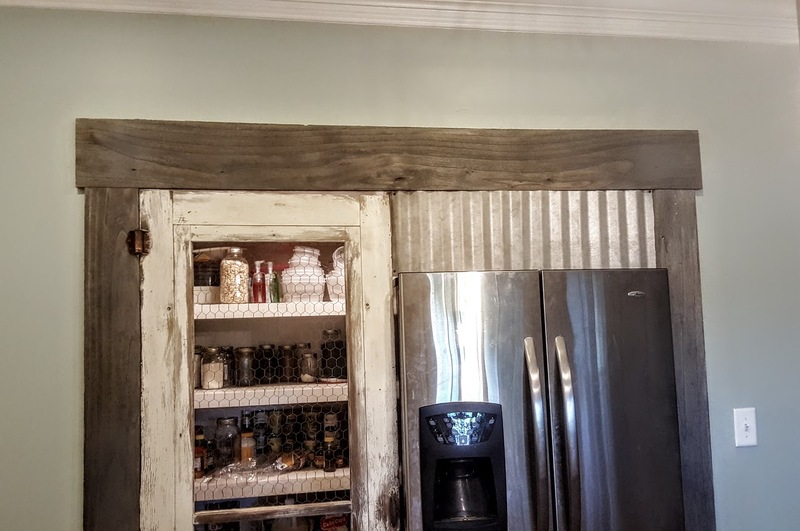 really look like it was a entry way and to give it some special meaning to me, I took some old metal from one of my papas buck barns that we cured tobacco in and framed out the hole above the fridge. I was so tickled with how it turned out! All that was left was to make a farmhouse sign! To make this sign I used a piece of very very thin plywood, cut to size. I painted with black spray paint a couple of spots on the sign so that when I sanded it it would show through. I then painted it with Lowes cheap .99 flat white paint. I used my printer to make the letters the font that I liked, printed on bold and as much ink as possible. I also set the printer settings to reverse so that when you lay it down on the wood the letters will be facing the same way. I used a little cheap paint brush of my daughters and took water and went over each letter and let it dry. When you do this it makes a outline of each letter on the sign like a stencil. I took a small brush and black acrylic paint and went to work. I used a very low grade sand paper and sanded over the sign to give it a distressed look. I used my dads skill saw to take the edges off of some rough cut wood and used them as my trim on the sign, using a nail gun. And there ya go! 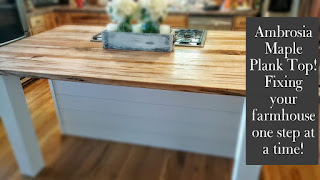 For my open shelves, I used some of Daddys wood again! What would I do without him. He really loved coming in from work every day and taking a look to see what mess I had made for the day! I cut the wood to the length I needed. I bought some cheap brackets from Lowes, I think around 5 each and used a stud finder to place them. Once they were mounted I could decorate. So its crazy, after all this work, this part for me was the hardest. Because I didn't want to just stick any old thing up on my new pretty shelves! So I started with getting 3 plastic jugs from Walmart for my flour and sugar. I used a adhesive paper from hobby lobby and my printer to fix those. Then I can list below what else I used incase you like them. greenery for the fall is also from Hobby Lobby on sale. What I've been Up To! Whew! Stuck in the kitchen! So basically I had already posted pictures of how I redid my island, that was in a previous post. 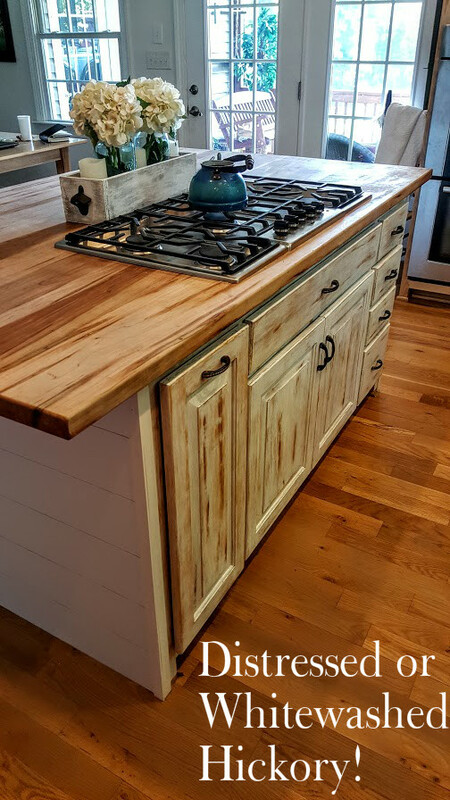 I took off the counter top, added ambrosia maple planks and added ship lap to the bottom. Then I knocked off all my tile on my back splash, replaced the sheet rock and continued the demolition on the other side. 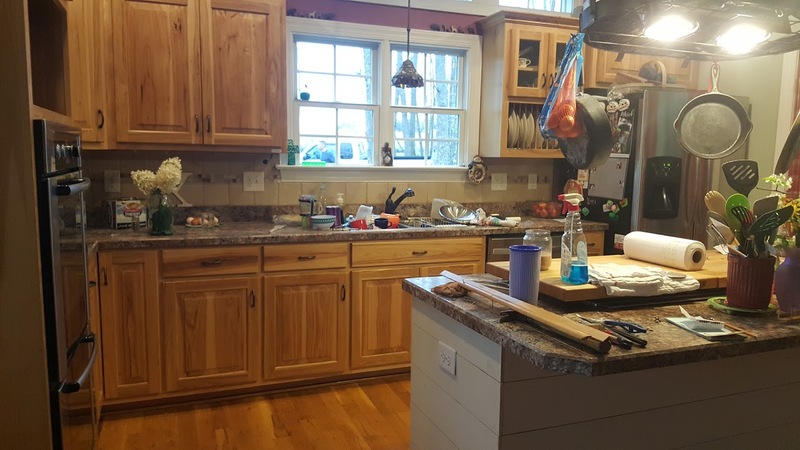 This will kind of give you a idea of what the kitchen looked like previously. I didn't realize just how dark it looked until after I finished. I had so many windows previously that I thought it "seemed" light. 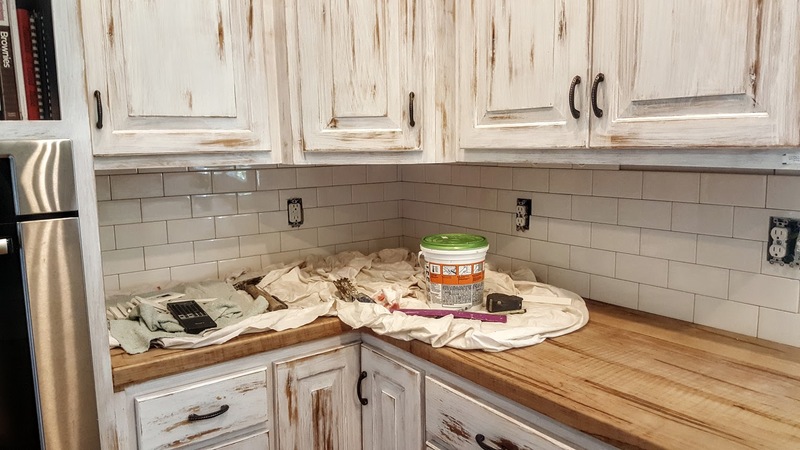 Please excuse all the construction, dirty dishes and just crazy mess that you see in these pictures! So now I can start to show you the steps. I first knocked all the tile off the walls, this may or may not have been the nicest way to handle tile. I kinda did it when my husband was gone to the fire dept. and lets just say he wasn't the happiest when he came home and saw the Gigantic holes in sheet rock! But no fear, I just grabbed some left over from the attic and cut and used sheet rock screws and replaced it once I cleaned up my mess. So I was in a rush to get done that day, and this picture is horrible, but you get the gist. Ok so here you can see, I have taken away the tired old red, and the wonderful Pot Rack(which is for sale by the way if anyone is interested). 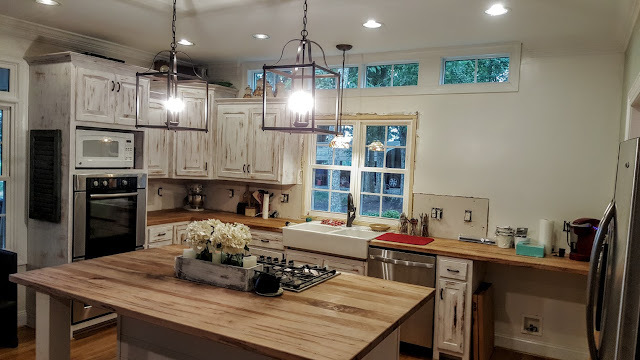 I have added old fashioned lantern lights and started to work on sanding the cabinets and whitewashing them to match my island. 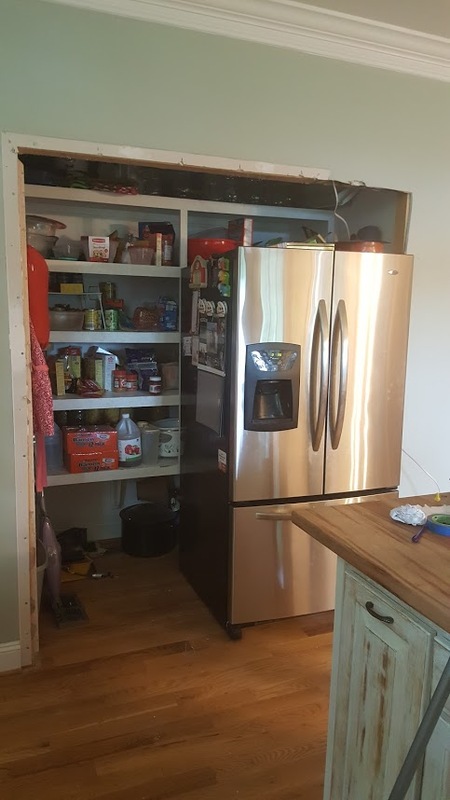 So once I finished my cabinets I decided to jump over to the pantry. I loved how I had a huge amount of storage. 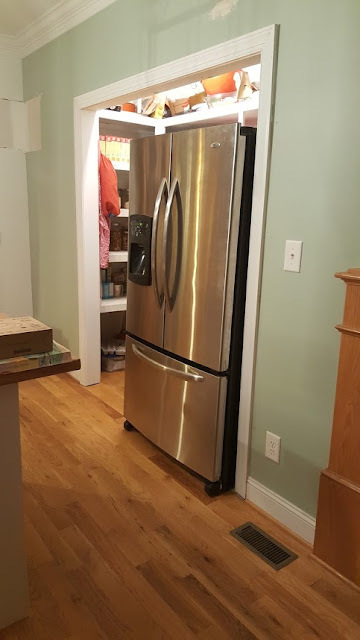 I didn't want to loose any of that, but hated how my fridge was stuck in the corner and every time I would open the door it would smack the wall! Ugh... I hated it!!! So I decided to try and move the fridge over into my pantry and make it look like a built in. But I wanted it to have a old barn look. So once the hammering and ripping out starts, little helpers will appear. 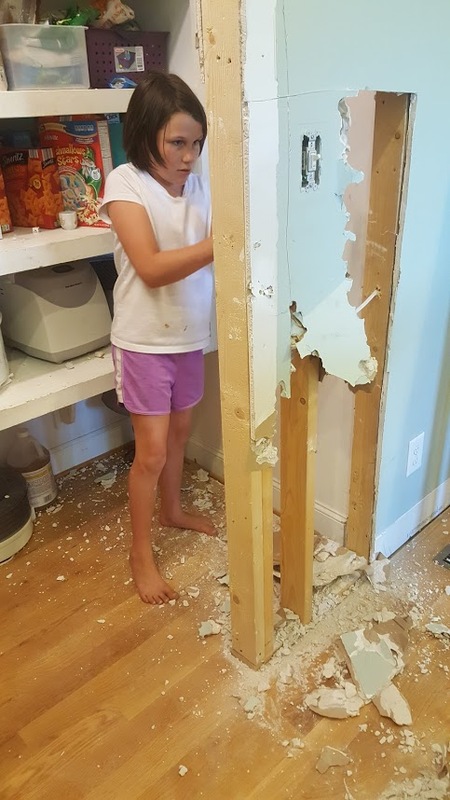 You can see here that Emma Grace decided that she wanted to help bust out some sheet rock. Before you start thinking, she has lost her mind!! I measured, measured again, and again to make sure all this would work. I did all this work my myself and I didn't want the hubs to totally freak out, so I wait till he is gone to the station and then I begin to work! That way he doesn't freak! LOL which if he does, he is so awesome, cause I've only seen it once or twice and he does so much better than me. Mine shows all over my face!! So then for 2 days I slide the fridge back and forth, yes, back and forth trying to just eat around it and work around it just to make sure I'm gonna like it and which side I actually want it to be on. I end up deciding that I like it best on the right side. And guess what? Both doors open and will stay open!!! So then its time to frame back up again. So I go to Lowes, those people I think know me by name now. 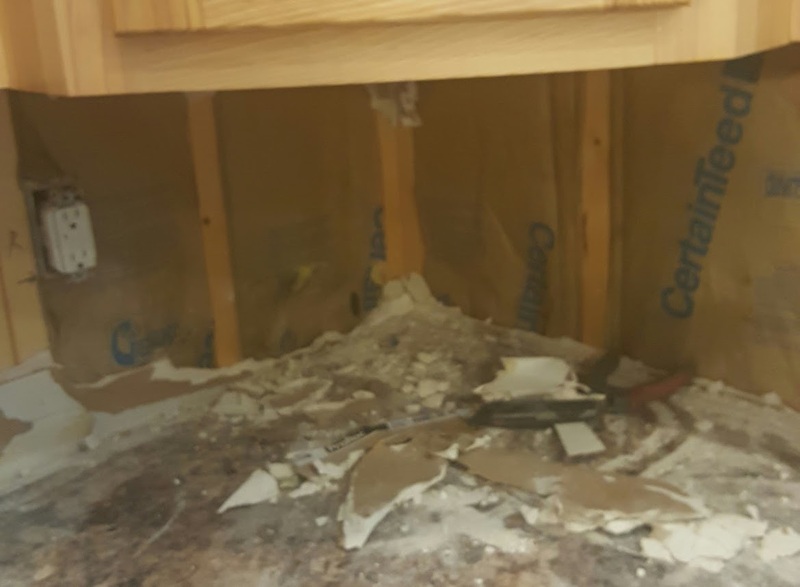 Help me to make sure I get the right stuff and I frame it back up before he can see the mess! Alrighty! 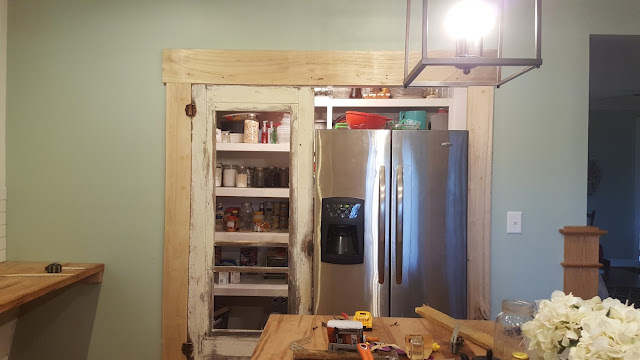 You ain't gonna believe this, but once I did all this work, I measured for the door on the other side, cause I really wanted one of those nifty barn doors that slide that you see all over pinterest that people make look so easy. Well, guess what? You need a perfect wall for that. 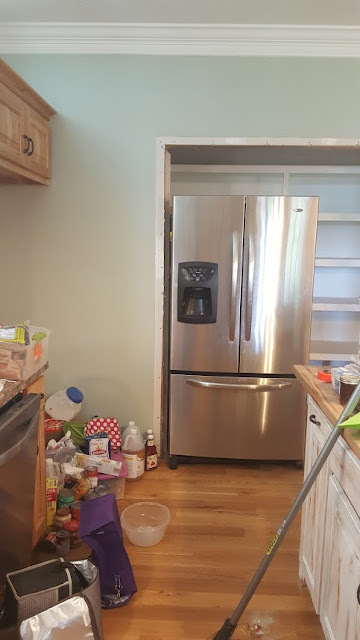 No counter top coming down the side, enough wall space to allot for the door to slide back on. It was a Mess!!! I'm so ill thinking I had this all planned out. Well, I kept thinking. 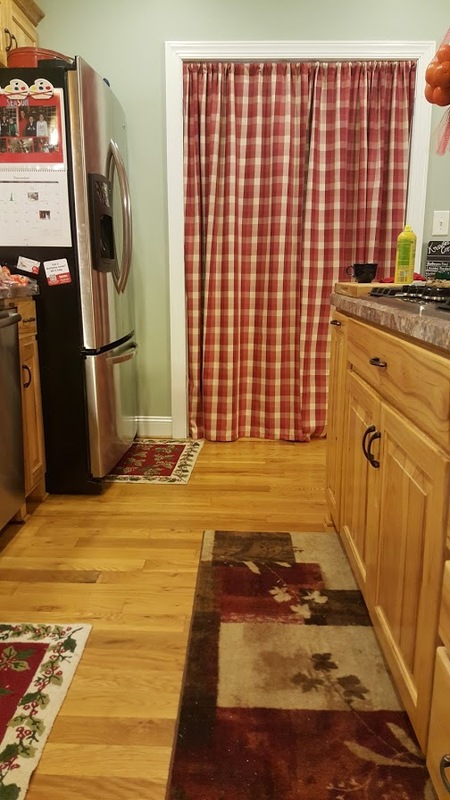 I got back on the other side of the kitchen. 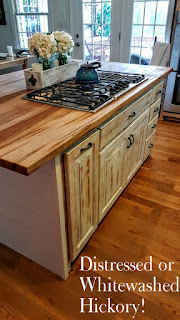 I ordered my plank tops for the counters. I then pulled my wonderful Ikea Farmhouse Sink out of its box! Yes, I could hear songs singing! We work all afternoon, cause dang this thang is heavy. I leave for VBS at church tell my hubby not to worry or work on it while I'm gone cause it is heavy. But what does that sweet husband of mine do? He works on it. Trying to have it in and ready when I get home. (and score some brownie points at it!) Well, needless to say I get the dreaded call at church that this has happened! Ok, so since I'm at VBS and needing to teach kids, how Christ loved us and how we shouldn't want to murder our husbands in their sleep, I just prayed and said Lord, I'm not sure how this is supposed to turn out, but please help me. The night went ok, I didn't loose it, once I got home I had the sweetest guy, he was just in all honesty trying to help me. But I didn't know what I would do. I had bought this sink back 6mths ago..... This is how awesome our God is. The next day I called the store and guess what? The week before this happened they changed the return policy from 90 days to 1 year?????? Can you believe this???? So me and my mom hop, that weekend, down to Charlotte and pick up and new sink! So I get it back and finally get it installed. Whew!! But as you can see its all coming together! 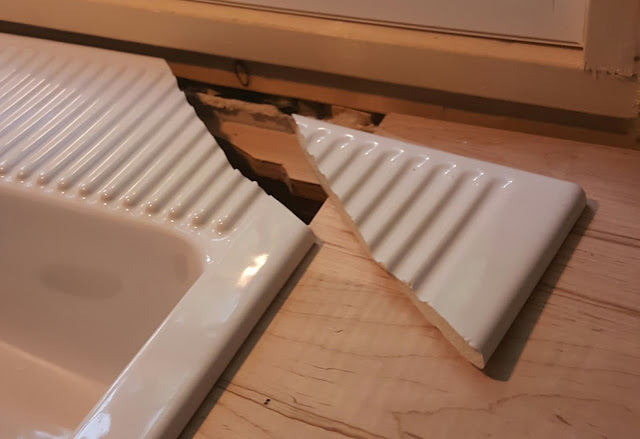 So next was the tile. I picked out white subway from Lowes. 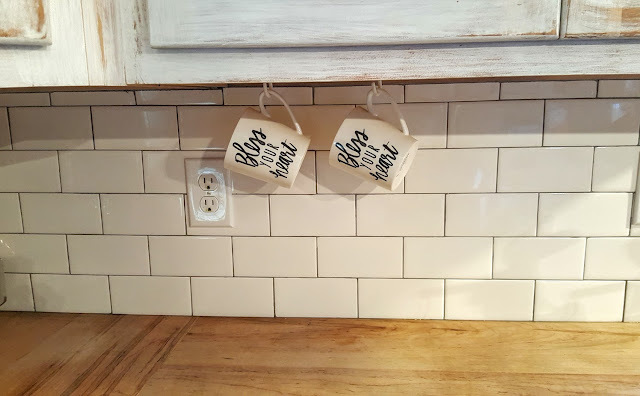 Didn't really know much about laying tile other than I wanted to try it. So I ask again my neighbor who knows how to do everything. He came by, dropped off his wet saw, showed me by laying 2 or 3 pieces of tile and said call if I got in a pickle. So that night I tried it. It's not no where near as hard as I expected! So the next day, I got it all up! I was extremely happy with how it turned out!!! So now to get my pantry fixed, light covers on, do my open shelves and decorate! See the next post to see how the Pantry turned out! 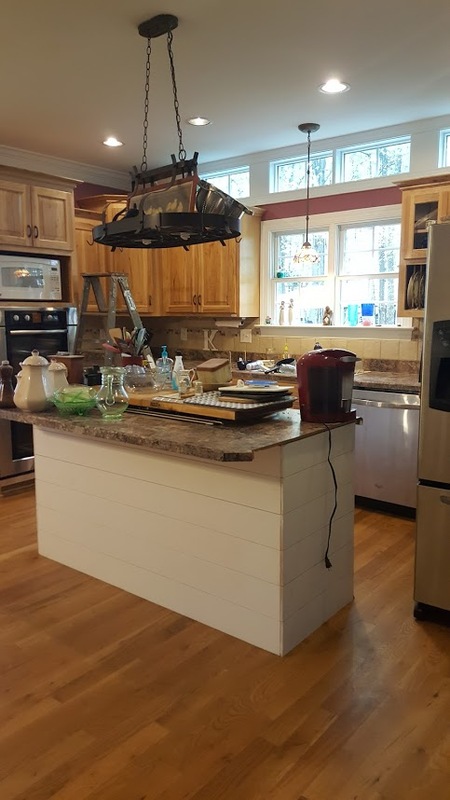 But this is the kitchen so far! I'm so excited to announce that I'm adding soap to my list of items. This has been such an adventure learning to make homemade soap! The kids have been able to help somewhat, but it was a little more to it than I expected. We are currently in the middle of working on all kind of Fall smells because that is the upcoming season. But right now we have some really good smells that have already cured. Who knew it took 4 weeks for soap to cure? I sure didn't, so we have had to start early to have it ready ahead of time. One of the current smells that we have are Oatmeal Honey. This soap is by far my favorite because I use it to wash hands, body, face and all. 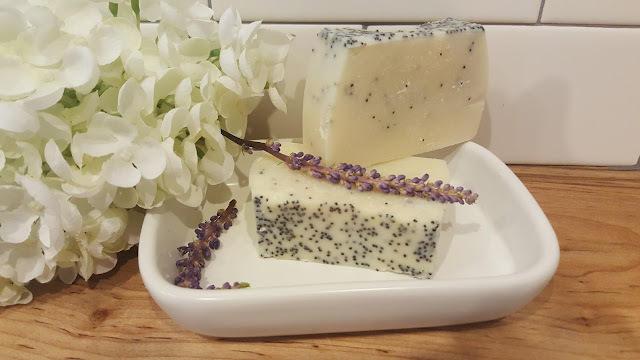 All of our soaps can be used for all things but some soaps I think are for body and some that are just ones you would want to put in the guest bathroom, because it looks and smells pretty. But this soap can do it all! The next sent we have is "Energy" Poppyseed. This soap is a blend of Citrus, including Grapefruit, Lemon and Lime, with hints of Cucumber and Jasmin, also a touch of Pineapple. Blackberry and Champagne. There are poppyseeds to act as a exfoliate to the skin to help remove dirt and grime. We also have Pumpkin Spice, Pineapple (manago, Popppyseed), AppleJack and Green Apple that are almost ready. All of our soaps are 3.75 each. Please let me know if you would like to try some! Visit Hayley French's profile on Pinterest. Hayley F Knowles. Picture Window theme. Powered by Blogger.